One of the key policy decisions at the apex level and now in the process of approval in the retail business sector, is the foreign direct investment (FDI). Since a lot will open up for MBAs in this area, the topic has become one of the favourites in GD round in B-schools for admission to MBA courses. Shared below is the real GD round on the topic in a top B-school. The GD round had a time duration of 20 minutes for 8 participants. The shortlisted candidates who participated in the GD round had scored between 85 to 91 percentile in CAT 2016. The names of the candidates participating in the GD round have been changed to protect their identity. Moderator - Good morning friends. 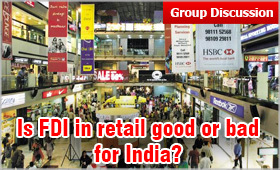 The topic for today’s Group Discussion is “Is FDI in retail good or bad for India”. You have one minute to think before starting the discussion. The observers will neither interfere nor participate in the discussion. Prashant – (Appears as if shouting) Friends, I am up against the FDI in retail. This FDI is nothing but entry of multiple East India Companies in our country. They aim to kill our small farmers, traders and retailers. In fact, Foreign capital will penetrate in the country and will seek ways to multiply itself with unthinkable application for profit. In long run, given out socio-economic structure, may cast doom and widen the gap between the rich and the poor. Akhshay-(Smiles and begins to speak in a clear but firm voice) – Friends, in my view it is always imperative to understand the topic before placing my views on it. FDI or Foreign Direct Investment refers to capital inflows from abroad that is invested to enhance the production capacity of the economy. However, FDI in retail is different from the investment in corporate, manufacturing, or infrastructure sectors. Retail can be single or multi brand and may be described as a sale to the ultimate consumer at a margin of profit. In a nutshell it is a retail store with a foreign direct Investment selling multiple brands under one roof. So it is the link between the producer/manufacturer and the individual consumer. (clears his throat and begins again – no one interferes) As we all know that Indian retail sector is highly fragmented with around 97 percent of its business being run by the unorganized retailers. The organized retail is in its infancy. With the entry of FDI the retail sector will become organized. Foreign investment in food based retailing would ensure adequate flow of capital into the country and its productive use, multiplying the same. I visualize that It will promote the welfare of farmers by agriculture growth and thereby increasing their income level instead of any harm caused to them. Shilpi ( Flashes a sign that she would like to speak) – Well, It is immature to remain confined to the local area during the era of globalization. We are talking about the world economy but wish to oppose the FDI. It is irony of the situation. In fact, Foreign Direct Investment in retail sector will spur competition as the current scenario is of low competition and poor productivity. India will flourish in terms of quality standards and consumer expectations. SriKant – ( has a sort of rough voice) – I do not agree and oppose the FDI. Country like America wants its citizens to be American and buy American, the President of USA Mr. Barack Obama has made his policy clear that he doesn’t favour outsourcing and would make all out efforts to stop outsourcing. When such developed countries are afraid of slowdown in their economy, why shouldn’t we? Are we more developed than America? Do we have higher GDP growth, higher per capita income or have abolished poverty from the country? None of it. Why then – are we thinking on such lines that we can’t afford? The foreign big guns like WalMart coming with huge investment, may not procure material from the domestic producers and might import the same from international market. This will add to the woes of already crumbling Indian producers. Rachna - I agree with Srikant. FDI is not the solution to all the problems. The fear is rampant on the existence of small Enterprises with the introduction of FDI in India. They will lose their existence. India needs more time for such ventures. Those sitting in the Government do not understand the plight of common people. Vikram – (grabbing the opportunity) - India lives in villages. The rural India is the true reflection of its diversity. Low Income group and Rural people depend on Public Distribution system for their foodgrain needs. The present PDS (Public Distribution System) on which a larger urban and rural population depends will receive a set back and it will be difficult to procure and redistribute the material, once the dependence on FDI increases. I do not favour it. Akshay - (Making second entry) – Friends if we go by the experience, whichever sector got competition, it improved not only in quality but also in prices whether it is in Airline services, banks, Insurance, automobiles etc. On the contrary, role of Intermediariaris, known with different names in different parts of the country, will be minimized. They flout the business ethics. Prices lack transparency, due share of farmer is not paid to him. Despite the development of Regulated markets in key areas like Delhi Vegetable, fruit growers have to face the monopolistic character of such markets. Indian farmers at present realize only 1/3rd of the final price paid by the consumer as against the 2/3rd price realized by the farmers in the countries with a greater share of organized retail. FDI will assist in reducing the dominance of value chain by the intermediaries. Shilpi - (also catching the clue) FDI will improve the investment in logistics of the retail chain leading to an efficient market mechanism. India is one of the biggest producers of fruits and vegetables (More than 180 million MT), it does not have a strong integrated cold-chain infrastructure with only around 5400 cold storages which have total capacity of about 24 million MT. The irony is that 80% of the capacity is used only for preservation of potatoes. The perishable horticultural commodities find it difficult to link to distant markets, including overseas market. FDI will become catalyst in avoiding this distress sale and erosion & wastage in quality and quantity of the produce. Manoj – (Making a hurried entry) Yes Shilpi, I have read that in accordance to the provisions made, any company going for 51% partnership in retail, shall have to tie up with a local partner. This will improve the income levels of all concerned and will make economy flourish with quality branded products at a lower price. Vikas – FDI will improve the overall economic scenario. It will serve as an antidote to inflation. The producer will get direct payment from the retailer and the same will be higher than what he was getting earlier due to the foul play by the intermediaries. Srikant (making second entry) – It is a myth. In fact, The unorganized retail sector, which is being criticized so much over here, is the largest source of employment after agriculture and has deep penetration in rural India. It generates more than 10% GDP of India. There is all probability that there will be a great job loss in this sector. The worst affected would be the rural youth. Akshay – (Making third entry despite knowing very less time is left) – We have to view it in the light of one fact and that is which is more beneficial. Since the FDI in retail will make the consumer happy as well as the small manufacurer. In the absence of intermediaries the consumer will end up paying less price for a better product and the farmer/manufacturer will also get better value for his product. Besides in the organized sector, consumer has to argue and fight a lot in case he has to return some faulty product to the retailer. This process will be standardized. So friends, allowing FDI in multi brand retail would bring about supply chain improvement, investment in technology, manpower and skill development, upgradation in agriculture sector, benefits to government through greater GDP, tax income. The organized sector would also emphasise to produce more and thus shall generate more employment in production as well as retail industry. Moderator - Thank you friends, time for discussion is up. Expert Feedback – The discussion was held in a healthy environment without much intervention and irrelevant talks. This enabled the candidates to have more time for discussion. Prashant - Began to speak taking the lead but didn’t show much of the knowledge or could express in a coherent manner. Not recommended. Akshay - Presented well organized thoughts made three entries, have good knowledge. Recommended with top ranking. Shilpi - Has good knowledge and grasp on the topic, flow of ideas is also good and can express effectively. Made two entries following Akshay but with different ideas. Rated 3rd in the group, if more than one or two are to be selected, she can be third. Srikant - Although has a rough voice but has the quality to penetrate and the expression of ideas make practical approach. Emphasised against the topic with logical arguments. Rated 2nd in the group. Manoj - Happened to read somewhere something but no grasp on the topic, nor he is able to present any concrete views. Trying to hit beside the point. Not recommended. Vikas - He couldn’t contribute anything to the discussion and has repeated something that has already been said. Not recommended.